Vernier calipers are incredibly useful devices. Once quite expensive, reasonably accurate models are now available from a number of sources for $10- $20. Computer-aided manufacturing techniques have brought the costs down dramatically over the old, time-consuming methods, and many calipers are now made from sophisticated plastics. Every restorer should have one. Why should you own one, you ask? Well, even though you might not be planning to rebuild an engine or transmission (where the caliper is an indispensable tool) you are surely going to run into situations wherein you need to make two parts fit tightly, measure between two holes, manufacture a part, etc. Calipers are amazingly useful. When choosing one, try finding a model that uses a thumb-roll device to open and close the jaws. Also, models that have adjustable "zeroing" are preferable to those that do not. No matter what you have you can be assured that the caliper's accuracy is at least to the nearest .001 inch, which is quite sufficient for routine use. This shows the zeroing adjustment. Note that the jaws are closed tightly and that the dial can be rotated to accurately set any specific measurement. The only maintenance required of calipers is to keep them clean. Don't drop one on the floor, because calipers are easily damaged. Calipers have both inside and outside jaws, so "guesswork" is not an issue. All you need to do is line up the jaws on/in the surface to be measured, taking care to keep the jaws 90-degrees to the actual surface. Most calipers have knife-edge jaws to facilitate this operation, so don't get too worried about being perfect. 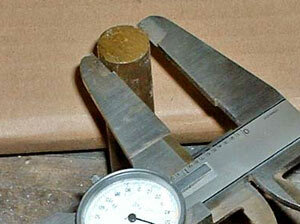 The knife-edge jaws can easily measure this brass bar's diameter, which means repeatable readings. Inside measurements can be easily accomplished, thanks to the inside jaws. 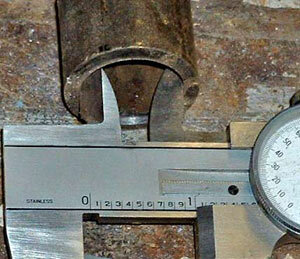 This is very important when measuring bearing clearances, fasteners and even trip pieces. Calipers are very useful for making parts too. When running a lathe you can use the caliper as a "go, no-go" tool. That is, set the caliper to the exact dimension you wish to create (either duplicating a piece or designing one from scratch) and then periodically use the set-and-locked jaws to slide over the turned piece. As you get close the jaws will provide an easy way to home in on your final measurement. 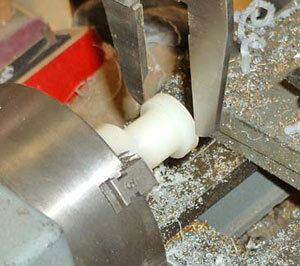 Making a duplicate plastic knob from nylon stock is easy with the use of a caliper. Try your hand with a caliper. You'll really enjoy using one and are sure to come up with a number of creative ways to put it to use. 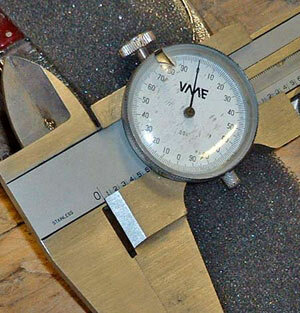 Measure your project carefully and do so a couple times to verify the dimension. Never try to line up the jaws to a line or mark.